Through their easy humour, sparkling wit, and an endless supply of alcoholic anecdotes, facts and beverages. The Thinking Drinkers are comedy at its best: when it’s educational, and punctuated with the occasional free drink. Comprised of Ben McFarland, three-time British Beer Writer of the Year, and Tom Sandham, author of the award-winning ‘World’s Best Cocktails’. The pair have a real passion for their craft and, of course, their booze. 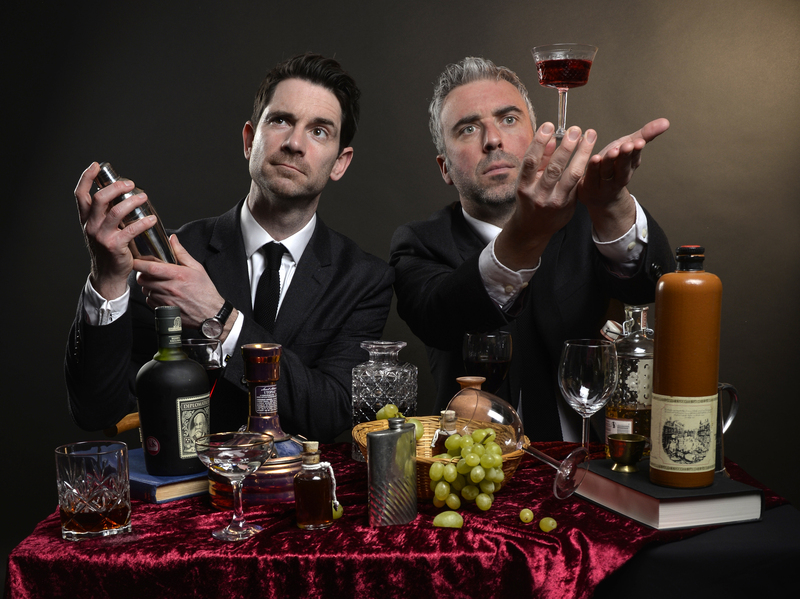 And so, to continue this fine tradition of performance, the pair are now on tour with their most recent show: ‘A History of Alcohol’. Aiming to map out just how booze has affected the course of human civilisation they take a stroll through time, lacing it with one-liners and free drinks throughout. From the first discovery of fermentation to the present day, from Alexander the Great to Andre the Giant. They chronicle the history of the world as seen through beer goggles, with all the chuckles, groans and exclamations of: ‘Well, I never knew that!’ expected from the pair. Despite their subject matter – and, indeed, their main attraction – the Thinking Drinkers are here to convince people of their ‘drink less but drink better’ philosophy. With comedy, anecdote and free samples they provide us with a fresh perspective on alcohol’s role in shaping the world we live in. And we did mention that there are free drinks? 1) You have been creating stage shows since 2011 when you debuted at Edinburgh Fringe, with that being where you started do you enjoy going back there each time with a different show? Yes, Edinburgh is a very special and unique place to be for the whole of August each year. It becomes a bubble of creativity filled with lots of talented people showcasing their talent for very little money at all. Doing 26 shows in a row is hard work but it’s a great way to ‘perfect’ what we do and get better. We love it up there and we’ll be going back there with a new show in 2018. 2) Your slogan is ‘drink less drink better’, with your shows giving audiences the opportunity to educate on alcohol. Was this something you aimed to do or just what came out of your shows? The tasting element has been integral since the very beginning. We’re not comedians or actors by trade, we’re journalists who have been writing about drink for more than 20 years – we’ve written books and won awards and everything. Our move from the page to the stage began with straight-bat tastings at food festivals before becoming increasingly theatrical and comedic. We realised that as well as the fabulous flavours in drink, people were interested in the stories behind the various spirits and beers – the people, the places and the past that have shaped them. So, with the help of a director, we turned what we did into a fully-fledged show and tried to tell these tales in the most interesting, and funny, way we can – but the tasting is very much still part of the experience. Each audience member gets five free drinks including the fabulous Frontier, a beer brewed like an ale yet conditioned like a lager by Fuller’s; Diplomatico Reserva Exclusiva Rum from Venezuela; Adnams Copper House Gin from Suffolk and Talisker 10 year-old Single Malt Whisky from the Isle of Skye. 3) Between the two of you, you have a wealth of alcohol related knowledge and insight with your skills and influences ranging across many different areas. Is it refreshing to have so many different projects running alongside each other? As journalists, we quickly realised that simply writing about a topic isn’t enough anymore. You have to be far more multi-disciplined in getting information across as people consume knowledge in a far more eclectic way these days. So as well as writing for newspapers and magazines, and doing the show, we do serious tastings and have our own podcast called “It’s The Drink Talking” which we record alongside Master of Wine Samantha Caporn. It keeps us on our toes. 4) Your latest show is titled ‘A History of Alcohol’ How far back in history can audiences expect to go in the show? Right to the very beginning. The reason that monkeys came down from the trees and evolved into man was initially because they were intrigued by fruit naturally fermenting on the floor. Without alcohol, we wouldn’t be here. 5) Each show you create has a different spin on alcohol and types of beverages so what makes this show different to the last? The last show explored how different cultures and countries approach alcohol – both now and in the past. You can tell a lot about a nation and its identity by the way it drinks. This show, however, explores how alcohol has influenced everything that has happened in history – ever. From evolution and faith to science, music, art and war. Drink percolates through all aspects of our past. 6) Are there any big projects on the way that fans should keep their eye out for?